Thermold Twin-Mag clamp. Holds two 30rd AR15 M4 Thermold or aluminum/other steel magazines securely in place. Light weight, durable, cost effective solution for faster reloading and higher capacity. You can also secure multiple magazines with the use of additional clamps. One clamp per purchase, magazines not included. (Will not work with many polymer magazines). Promags are lightweight and durable and guaranteed to perform for the life of the magazine. Any problems Promag will replace them right away. Comes in a clamshell retail style package. Promags are lightweight and durable and guaranteed to perform for the life of the magazine. Any problems Promag will replace them right away. 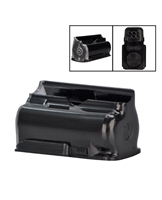 These 30rd polymer magazines are perfect for your AR15 platform. State magazine restrictions apply, know your state's laws prior to purchase. Factory Steyr SSG 5rd rotary magazines for the famous Steyr SSG Sniper Rifle. Will fit models 69, PII, PIV. Brand new from Steyr.